This is the story of Lisa and her evolution from being a successful corporate lawyer in New York City to leaving that life behind to follow her passion and become a full-time jewelry designer. How her collaboration with David Benlolo, as her instructor and mentor, has been instrumental on her journey for the past three years. Lisa, how did your interest in jewelry-making and design evolve? On a return trip to my mother country, I discovered a love of vintage glass beads and a new found respect for gold, both of which are a part of Ghana’s heritage. 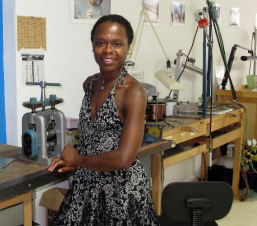 When I returned to New York City, I still worked as a corporate lawyer but wanted to learn about metalworking. I found David’s classes online. I had no prior experience and started going to his classes two to four times a week after work. Within a few weeks I finished my first piece, a ring. It was very exciting. Why did you choose to work with David at the time? I needed flexibility and didn’t want to learn in a formal, structured classroom environment where everyone is taught exactly the same thing at the same time. I wanted someone to teach me how to create what I wanted to make which is what I was able to do with David. At what point did you decide that you wanted to make jewelry design your profession rather than a hobby? It started when friends liked the jewelry I made for myself and asked me to make pieces for them. I started making wedding bands and engagement rings and then expanded to other types of jewelry. My business grew mainly by word-of-mouth. In my second year with David, I knew this was what I wanted to do full-time -- it just felt right, but I still needed to work as a lawyer to earn a living. Where does your jewelry business stand now? In just over three years, I turned something of deep interest but with no experience, into a hobby and then into a full-time career. This year is a big turning point: I left my lawyer profession and now earn my living as a jewelry designer. I have a website, write a blog, have a nice growing clientele and am developing my own brand. I love it. It is my dream. How did David help in your evolution from jewelry novice to professional? Working with David changed my life. It has literally been a life- changing experience. I have learned so much from him in very specific ways but he is also very empowering. He helped me build confidence in myself and what I am capable of. How would you describe David’s teaching style? David’s teaching style is very “organic”, personalized, and nurturing. I think of David as a Master teacher and I am the apprentice: I am “climbing a ladder” of knowledge and experience. Our relationship is very collaborative. I tell him what I want to learn and that’s the path we will go down for a while. Then it will be another path. After three plus years, I continue going to David’s classes almost every day – I still learn and grow every day. What are some specific ways in which his knowledge and guidance are helpful to your business? There are many, and it changes all the time. At the beginning, I wanted to learn everything about creating gold “blends”. I learned how to melt and mix gold with alloys such as copper and silver. I now have my own blends, which I offer to clients. For example, I have a beautiful 18K rosy-colored gold blend. Right now I am very interested in everything about stones. David is an expert with stones including precious and semi-precious. I get most of my stones from him; he buys them from direct sources on his travels around the world. He is teaching me about the different qualities of stones and how to appreciate them. For example, when and how they should be cut to improve their appearance and value. David has an incredible network of contacts “rolodex” in the business. He introduced me to high quality casters, engravers and stone setters, all of whom are critical to developing a successful business. It would take years, if ever, to develop these contacts on your own. He also helps me find the right “price point” for jewelry, taking into account the materials, level of work and so on. Questions and challenges arise all the time when I get new orders. It might be, what is the best technique to use in making a more complex piece; deciding on the best stones or cut; setting a fair price. He helps me with these kinds of things all the time. Recently, it was how to create a delicate piece of jewelry without compromising its strength and integrity. These are just a few examples. How would you describe your personal design style? Where can people find you online? with a modern design sensibility. Thank you for taking the time to talk with me. I wish you continued success! Thank you and let me take this opportunity to thank David without whom all this would not have been possible.